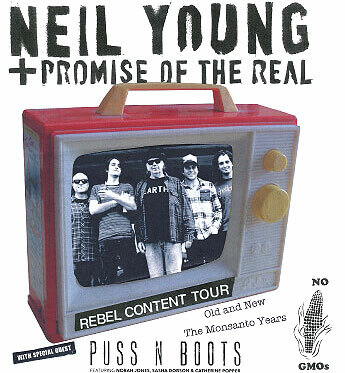 On June 16 Neil Young & Promise Of The Real will release a new studio album, The Monsanto Years, via Reprise Records. According to a statement, “the politically/ecologically-charged album will be released via participating digital retailers and Young’s online music store PonoMusic.com as well as on physical CD and vinyl in stores and through Neil’s official web store. The Monsanto Years is the first studio collaboration between Neil Young and L.A. rockers Promise Of The Real, a band fronted by Lukas Nelson (vocals/guitar) and Micah Nelson (guitar, vocals), along with Anthony Logerfo (drums), Corey McCormick (bass) and Tato Melgar (percussion). Young & Promise Of The Real played a stealth show on Thursday in which they debuted a slew of material presumably from the new LP. Neil Young & Promise Of The Real will soon embark on the Rebel Content Tour. With every ticket purchased online, you’ll receive a choice of a standard physical CD or standard digital copy of Young’s new album, The Monsanto Years. Band Of Horses and Puss N Boots will open select shows. The tour begins at Milwaukee’s Summerfest on July 5 and includes a pair of performances at Red Rocks as well as visits to sheds in the Midwest and Northeast plus a headlining appearance at WayHome near Toronto.